You are Here: UniPay Gateway > FAQ > Can UniPay handle payment aggregation and sub-merchant funding? Payment aggregation is a concept used to process payments (credit card and ACH) belonging to different unrelated merchants under a single merchant account. It was traditionally used to simplify payment processing mechanism (especially underwriting) for small businesses, as well as, to enable businesses, which are unable to go through underwriting, to have access to merchant services. Over time, due to lack of transparency, aggregation was discouraged by payment processors and payment gateways and was a replaced with a similar concept, generally referred to as sub-merchant funding. In the sub-merchant funding, the transactions from unrelated merchants are still processed together, but unlike aggregation, submerchant funding requires each participant of the aggregation process to have its own merchant account. To simplify underwriting, however, the merchants are not set up as individual entities, but rather as sub-merchants of a larger payment facilitator, who is legally and financially responsible for all of the sub-accounts. UniPay gateway is the ultimate solution for payments aggregation and is a preferred choice of many enterprise level payment facilitators. It is designed to support complex payment aggregation scenarios and has elaborate logic around payment remittance process (de-aggregation). Among its key features for payment aggregation and sub-merchant funding are support for cost-plus and fixed-rate pricing, statement generation, automated ACH funds disbursements, support for reseller/channel commissions’ kickbacks and many others. Your payment gateway questions answered by our team. 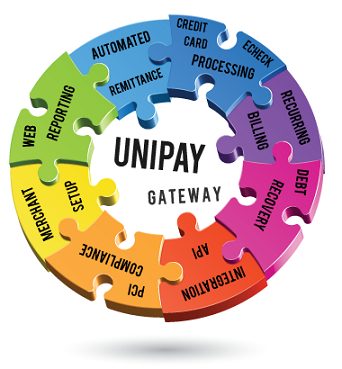 Answer to a commonly asked question of whether UniPay Gateway can handle payment aggregation.